About: Bar Estrela is a Portuguese bar with plenty of pavement tables. It serves a variety of Continental dishes. Non smoking areas are provided. Catering for private parties of up to 40 guests is available upon request. The tapas menu is excellent, my favourite is the "moelas" and "picado" on the meat side and "calamari" and "polvo" on the fish side, the desserts are, well, just try the "molotoff" I hope I spelt it ok, I could explain what they are but why spoil the surprise. 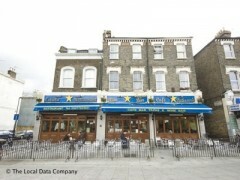 Although a small restaurant/bar, the atmosphere is very warm and welcoming in particular if you have children.